Looks like SkyBet listened to my design advice! Last month I wrote a blog post giving SkyBet a design advice (read the post here). 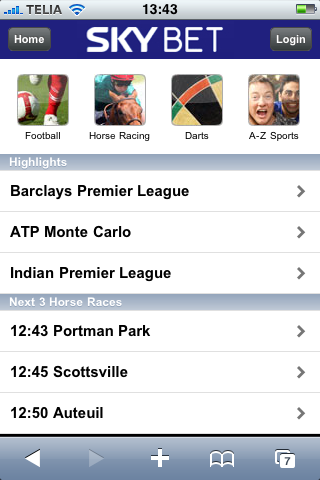 And today when I tried going to SkyBet using my iPhone I noticed that they had implemented the solution I wrote about. My design advice back in September was “The second solution is just to transfer the user to the “skybet.mobi” site when they are using and iPhone and comes to “skybet.com.” and that is how it works today! Well done SkyBet!